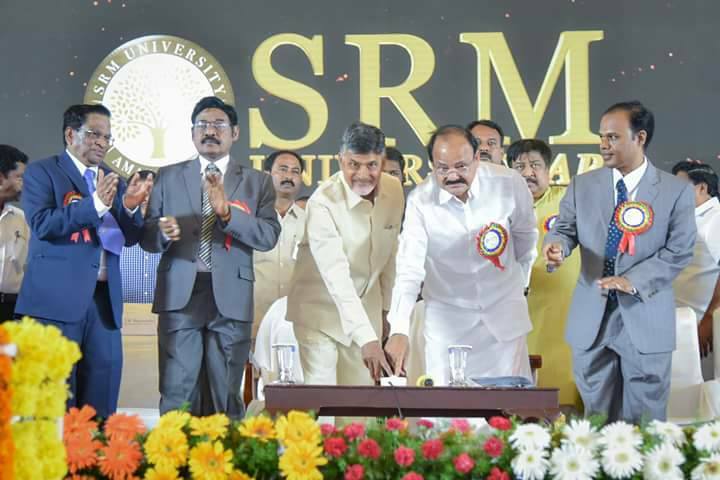 SRM University, AP Amaravati was inaugurated by Chief Minister of Andhra Pradesh N Chandra Babu Naidu and Union Information and Broadcasting Minister M Venkaih Naidu here on Saturday in a pleasant weather condition. On this occasion, Chandra Babu Naidu has reiterated his commitment for the comprehensive development of Amaravati, the capital of Andhra Pradesh, the newly formed state. He said ‘I am committed to promote the establishment of higher education institution and other establishments to transform the Amaravati as one of the best cities in the world’. 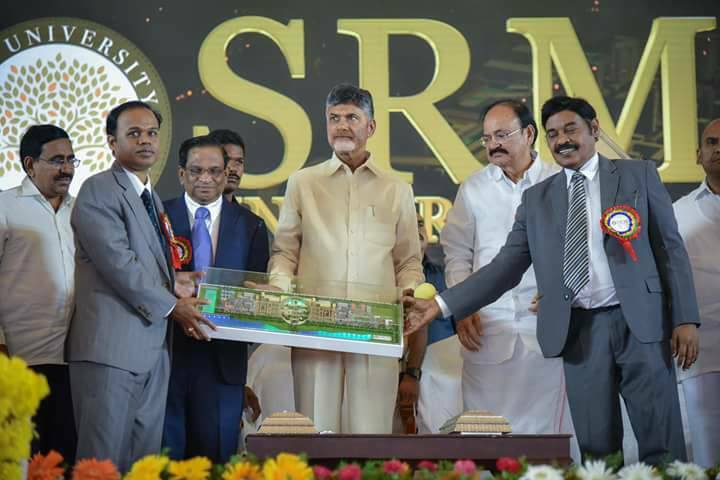 Chief Minister N. Chandrababu Naidu inaugurates SRM University, AP – Amravati. 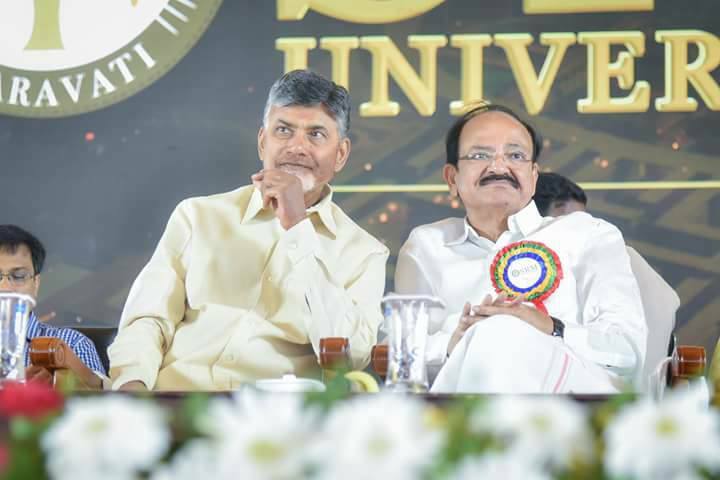 “I am sure within a span of five years, SRM University with 10,000 students would be a top ranked world class university, with multi stream research in the fields of engineering to management, liberal arts & humanities to law, medicine to health sciences to make Amaravati recognized by foreign countries as the best educational hub of the globe”, said Mr. Naidu. SRM is working with MIT, U.S. (Massachusetts Institute of Technology) forthe design and development of their curriculum through the use of MITx courses. These courses will incorporate the concepts of hybrid learning by utilizing both traditional and technologically enabled teaching methods. exposure and all faculty members having PhDs from foreign universities, IITs or IISc.Around 30 faculty members have been appointed across different disciplines and over 20% of the faculty recruited are foreign nationals. “We aim to bring a confluence of international ideas, technological innovation, and social impact, creating an ecosystem of meaningful creation originating at Amaravati and impacting the entire state, nation, and the world.”, says Dr. Sandip Tiwari, Cornell University, U.S., and newly appointed Vice Chancellor of SRM University, AP – Amaravati. The university will also establish centres of Excellence in Renewable energy, Satellite technology, Internet of Things (IoTs), Blue Economy, Artificial Intelligence (AI) & Machine Learning, Rolls Royce – SRM Corporate laboratory, Jal – Janak Rail energy, and CRISPR for pushing the frontiers of modern technology. “Semester abroad programs and company internships across the world would also be present to create innovators and global leaders.” says Dr. Narayan Rao, Pro – Vice Chancellor of SRM AP. B.Tech programs in CSE, ECE, EEE, and Mechanical Engineering are being offered from the academic year 2017-18. To attract meritorious students, 50% tuition waiver is being awarded to students getting an aggregate of 90% and above in PCM subjects in CBSE or an aggregate of 95% and above in PCM subjects in any state board. For the top 25 admitted students who meet this criterion would be given 100% tuition and hostel fee waiver. Amaravati is rapidly evolving as an industrial hub. Several industries, R & D organizations are being established in Amaravati. Thus, all the students of SRM University – AP, Amaravati will have ample opportunities as interns in these industries and get industrial exposure. The skills developed and the work exposure will help them get placed in globally known organizations.